The Caterpillars of this species bore into the stems of trees, particularly trees in FABACEAE. The female adult moths have green forewings, each with a brown submarginal band, and brown areas along the costa and the hind-margin. The females have orange hind wings. The female moths have a wingspan of up to 7 cms. The male adult moths have pale green or brown forewings, each with two narrow dark-edged white lines forming a large 'V' shape. The forewings each have a bulge on the costa near the wingtip. The hindwings of the males are white. 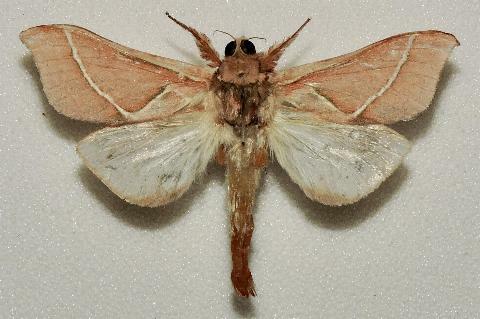 The male moths have a wingspan of about 4 cms. Volume 15 (1892), p. 5. CSIRO Publishing, Melbourne, 2018, pp. 139-140, pp. 46, 51, 123-126, 132-133, 205, 224, 243, Plate 24: figs. G and H.